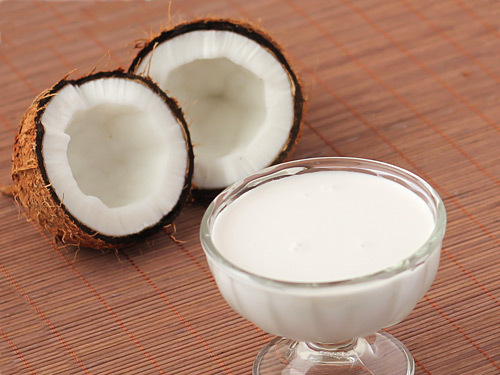 Coconut milk can be used as a medicine and it is an effective cosmetic product. We hope that the following 15 benefits will surely convince you to use it every day. Coconut is made up of several layers. The outer dark brown and “hairy” hard shell has three holes on its base. Then comes a thin brownish “skin,” and white, creamy and edible coconut meat, and finally, in the middle, there is a milky coconut juice or water. This juice is often mistakenly referred to as coconut milk -- real coconut milk is produced from its “meat”. Coconut milk is therefore the fluid that is released from grated pulp or coconut meat. Its color and rich taste milk can be attributed to the high content of fat or oil. Coconut milk is a common ingredient in many tropical cuisines while in the West it is mainly used in the preparation of drinks and cocktails, and plays an important role in the vegan kitchen. Coconut milk is rich in lauric acid which is also found in significant amounts in breast milk and the secretion of the sebaceous glands. This acid contains “good” cholesterol and it is very beneficial for the human body. In the body it is converted into monolaurin, a compound with antiviral and antibacterial properties. Coconut milk is extremely versatile and it is greatly used in cooking, especially in vegan and exotic cuisine. It is rich in vitamins C, E, B1, B3, B5, B6, as well as iron, selenium, sodium, calcium, magnesium and phosphorus. It is not only beneficial for your digestive system. Coconut milk is an effective beauty product. Add some coconut milk to your morning cup of coffee and boost your energy -- it is not just the caffeine, but also the electrolytes contained in the milk. Coconut contains potassium, sodium, magnesium chloride, and these keep the body hydrated and properly functioning. What more can you ask for the beginning of a long day? Coconut milk adds a sweet and delicious “touch” to the meals. Coconut milk contains 89 milligrams of magnesium per cup, which makes it a rich source of minerals that calm the nerves and maintain normal blood pressure. Magnesium calms nerve cells and then they reduce the muscle contraction. The result: You will feel relaxed. Coconut milk is not a good source of calcium. It contains slightly more than 38 milligrams of calcium per glass compared to ordinary milk which contains 300 milligrams in the same dosing. But, it is a rich source of phosphorus. With 240 milligrams per cup, coconut milk strengthes the bone structure. Regardless of whether it is applied orally or locally on the skin, coconut milk moisturizes the skin and makes it soft and smooth. Simply apply a thin layer of coconut milk on a clean face, leave for 15 minutes and rinse. Your skin will be really soft. Coconut milk contains lauric acid, a fatty acid which is very beneficial for the human body. In the body it is converted into monolaurin, a compound with antiviral and antibacterial properties. Because of its fiber content, coconut milk makes you feel satiated for a long time and when used in moderate amounts it can help you control your weight. It is a rich source of manganese, which is vital for the regulation of blood sugar levels. One of the most important functions of the manganese is to help the glucose metabolism in the human body. Manganese is essential for the metabolism, treats inflammation, prevents osteoporosis, relieves PMS in women, helps the absorption of vitamins and maintains the health of the gastrointestinal tract. Mix 1 part of coconut milk and 2 parts with olive oil and use it as a gentle product to remove eye make-up and to moisturize the skin -- at the same time. There is no need for heavy, alcohol-sodden chemicals to remove the make-up from the most delicate area on ​​your face. Coconut milk does miracles! Despite its saturated fat content, coconut milk can actually help you reduce cholesterol levels. Coconut milk actually increases the blood cholesterol, but its lauric acid increases the levels of HDL (good) cholesterol. The fats in coconut milk are easier for the body and the metabolism because they are healthy, including omega-6 essential fatty acids. Improve the skin elasticity with coconut milk -- thanks to its vitamin and mineral-rich composition, it will retain the flexibility and elasticity of your skin and blood vessels, and slow down the aging process of your skin and body. After a long day in the sun, it is not a bad idea to continue in the tropical mood -- use coconut as a medicine. Apply a thin layer of cold coconut milk on the skin area burned by the sun and see how it will soothe and hydrate your skin. Coconut milk contains selenium which is an antioxidant that relieves the symptoms of arthritis. Selenium controls the effect of free radicals and reduces the risk of inflammation in the joints. Massage some coconut milk into the scalp and using your fingers spread it to the ends. After that, wrap your hair in a towel and leave the coconut milk on for an hour or two. Leave it on as much as you can, it will deeply hydrate your skin and the effects are stronger -- as it will penetrate deeper into the hair.